In the event of inclement weather conditions, parents should always consider the safety of their children in deciding whether or not to send them to school. The decision to cancel student transportation and or Schools / Board Administrative Operations is often a difficult call to make. Please be assured that the decision to remain open or to close is always made with the safety and security of students and staff in mind. Decisions are made collaborative by Senior Administration at both Member Boards based on relevant information at that time. 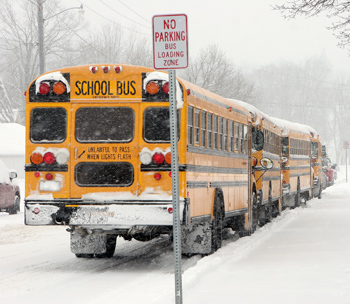 School Boards across Ontario have varying polices about the cancellation of schools. The cancellation of student transportation immediately triggers the cancellation of School and Board Administrative Operations for the HWDSB. In the event of inclement weather, HWSTS requests contracted service providers to drive predetermined routes to assess the condition of the roads. This is done prior to 5:00 a.m. The drivers report back to the carriers and HWSTS begins to receive reports by 6:00 a.m.